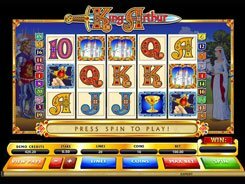 King Arthur is a 5-reel 20-payline slot developed by Microgaming and inspired by legends of King Arthur and his knights. 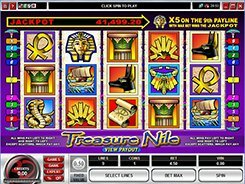 It features two wild symbols, a scatter and a Camelot bonus game. 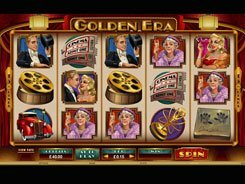 Before spinning the reels, you can adjust the betting options choosing a coin value ($0.01–$0.5), the number of coins per line (1 to 10), and the number of lines you want to wager on. Thus, the minimum and maximum bets amount to as little as $0.01 and $100 accordingly. On the reels, you will come across playing cards from 10 through ace, and themed symbols like the Grail, Merlin, King Arthur himself, the Excalibur and the Castle. 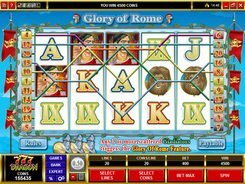 Merlin is a wild symbol that stands in for all non-feature symbols and pays out the second-largest jackpot of x5000 times a bet. 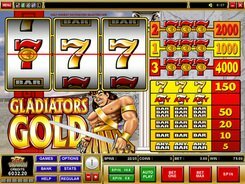 King Arthur is an extra wild, multiplier symbol that helps complete winning combos, doubles payouts, and awards the slot’s first jackpot worth x10,000! So betting max coins, you can grab up to $50,000 in one lucky spin. 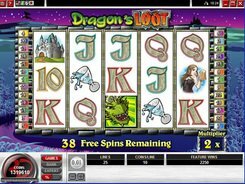 The game has no free spins, but it offers a bonus game triggered by 3+ scattered Castles. In the bonus feature, you help King Arthur get back to Camelot by choosing different paths and getting generous awards en route.